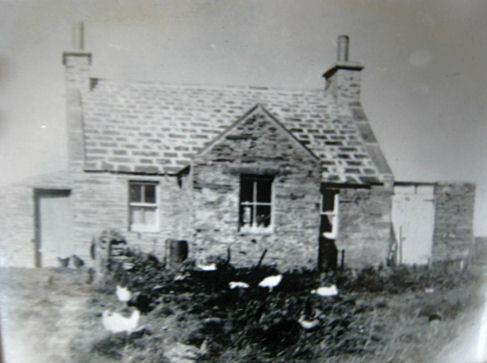 A number of small local poorhouses and parish lodging houses existed in Orkney. These establishments seem to have varied considerably in their nature. For example, in the 1881 census, Kirkwall had a parish lodging house with a resident "matron" on Main Street but only one of its eleven inmates was described as "Pauper". Other locations were sufficiently established as poorhouses to be labeled as such on Ordnance Survey maps. Some of the local poor relief establishments in operation prior to the opening of the Orkney Combination workhouse at Kirkwall in 1883 appear to have continued in use well after that date. On Mainland, the united parishes of Birsay and Harray had a poorhouse in operation by 1861. It was located at the east of Dounby. The remains of the building are now in the grounds of a property known as Mirbister. Birsay and Harray poorhouse site near Dounby, 1902. 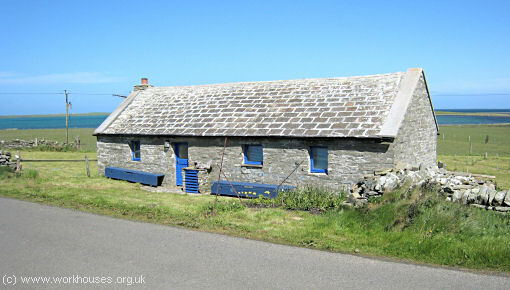 Former Birsay and Harray poorhouse from the south, 2007. The present occupant of Mirbister recalls that until the 1940s, the poorhouse continued to be occupied by two elderly ladies, one of whom was called Maggie Currant. It seems that the two women did not get on and occupied opposite ends of the building and having as little as possible to do with one another. They grew vegetables in a kail yard, traces of which can still be seen, and cut peat for heating from a site somewhere to the north. The lives of the women was apparently brightened by occasional deliveries of alcoholic beverages by local people. Birsay and Harray poorhouse kail yard, 2007. The parish of Orphir had a poorhouse at the south of Kirbister. In 1881, it had a single resident — a 77-year-old unmarried woman named Betsey Hay. The building is now an outhouse for a property called Newhouse. Former Orphir poorhouse from the south-east, 2007. 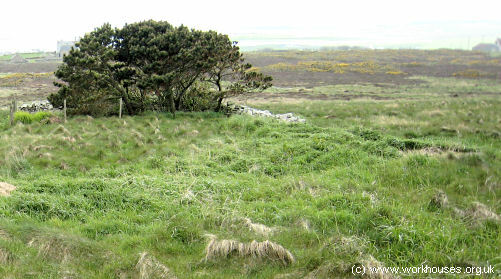 At the east of Mainland, the parish of Deerness provided a poorhouse near Grindigar. Its location is shown on the 1881 map below. The former Deerness poorhouse has now been converted to residential use. Former Deerness poorhouse from the south-west, 2007. 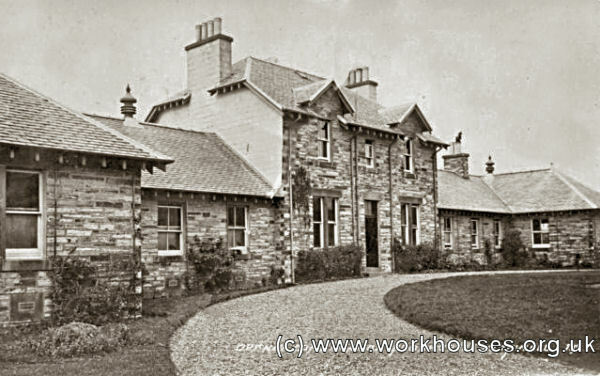 On the island of Westray, a poorhouse was established at Kirkbrae in 1883. The building was also intended for housing persons suffering from cholera or other endemic or contagious diseases. Construction work was carried out by masons John Reid, James Reid, and John Allan who were paid £43 16s. 7d. Plumbing and joinery work was done by David Reid and Co. at a cost of £36. The building contained four small rooms, each with its own fireplace. One room led directly off the porch, and the other rooms each had a door leading off the first. A lean-to coal-shed stood at the southern end of the building. In February 1884, advertisements were placed locally for the supply of four iron bedsteads and straw palliases. Westray poorhouse from the south, date unknown. The poorhouse never seems to have been occupied to its full capacity. The 1891 census lists the inmates as sisters Betsy and Harriet Patterson. Betsy died in 1916 at the age of 71, and Harriet continued in residence until she died in 1930 aged 78. The building then stayed empty until 1946 when it was taken over as a private house. The building was renovated and extended in 1974. Westray former poorhouse from the north-west, 2007. 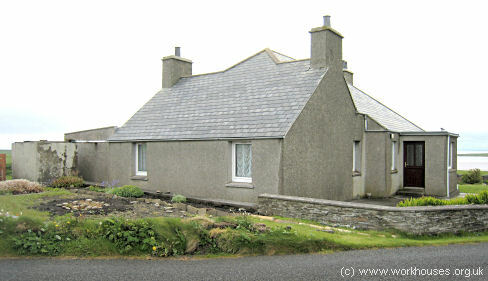 On the nearby island of Papa Westray, the house called Dykeside at the south-west of St Ann's Kirk, appears to have functioned for a while as a poorhouse in around 1900. On Sanday, the parish of Lady had a poorhouse at the north-west of the village. The building still exists as a private house bearing the slightly odd name of Riverside. Towards the south of Sanday, a poorhouse was set up by the parishes of Cross and Burness. It appears to have comprised three separate dwellings. The much altered building is now an outhouse for a property called Var Hjern. Cross & Burness former poorhouse, 2007. Eday had a "lodging house for the poor" located at the south of the island. The 1871 census indicates that it contained two dwellings. In one were recorded 68-year-old James Gullion, his wife Jannet, and their grand-daughter Jannet aged six. The Orkney Combination was formed in around 1880 and comprised the parishes of Birsay and Harray, Cross and Burness, Eday, Holm, Kirkwall, Lady, Orphir, South Ronaldshay, Roushay and Egilshay, Shapinshay, Stronsay, and Westray. According to the 1881 census, the total population in the Combination was 21,574. In 1882-3, the Combination erected a poorhouse at a cost of about £3,000 to accommodate up to 50 inmates. 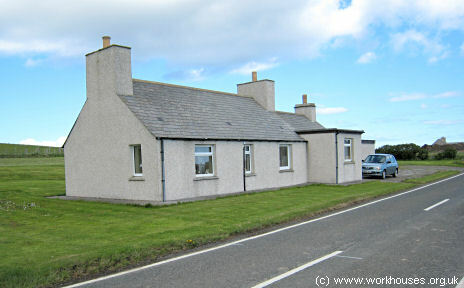 The building was located at the west of Kirkwall on what is now Old Scapa Road. Its location and layout are shown on the 1902 map below. Orkney Poorhouse from the southt, c.1905. On 12th September, 1883, the Orkney Herald carried a report of the opening of the new poorhouse. A portion of this poorhouse is now made available for pauper inmates to the extent of 40, and the various inspectors whose parochial boards are under the combination have now been communicated with that they may send in any of their paupers requiring poorhouse accommodation, or apply it as a test for any that they may suspect who have no right to parochial relief. In the course of a very short time it is expected that the unsanctioned portion of the house will also be fit for occupation. The poorhouse, which is to accommodate 50 inmates, is erected at the south end of the town, fronting Scapa Road. The building is T-shaped—the principal block measuring 138½ feet in length. In the centre it is two stories high, containing committee room, office, and governor and matron's apartments, storerooms &c. The south portion of the front block is divided into small and large dormitories and day room for males, and the corresponding north portion for females, both having bathrooms, lavatories, and water-closets at the back, and also entrances to the airing yards, which occupy the spaces between the front and rear blocks. The dining hall, measuring 28 feet by 17½ feet, is placed immediately behind the central block, and is approached by corridors from male and female divisions. It is lighted by three large windows on the south side, and will also be used as a chapel. In the same direction, and adjoining it, is the kitchen, with scullery, pantry, storerooms, &c., attached and having connection with the front block by a passage running along the north side of the chapel, and to the women's airing yard by a separate lobby and door. The rear-block is occupied by servants' rooms, larder, laundry and washing-house, &c., and separate probationary male and female wards, each containing dormitory and day room, with baths and water closets in connection, and small airing yards adjacent. A fumigating apartment is provided, entering from the principal passage in this block, near the males' ward, in which the clothes of the entrants will be disinfected. On the south side of principal males' airing court are erected dead-house, workshop, and other conveniences; and on the north side, in the women's court, are corresponding offices, coal-shed, and refractory cell. Great care has been taken to obtain good ventilation throughout the building by means of the large ventilators of the Sanitary and Ventilation Company placed on the various ridges, with close flues leading from the various ceilings thereto. Dodds' patent "wash-out" closets, with special and separate flushing cisterns, are used throughout, all the soil-pipes being ventilated by means of pipes passing above the eaves of the roof. Provision in case of fire has also been made by carrying a large branch from the adjacent public water main into both the airing yards, and fitting a hydrant in each. The building, the principal front of which looks to the south-east, is very plainly constructed of Wallywall stone, in square rubble work, without freestone dressings other than sills and lentils to openings and chimney copes, which are of red freestone from Pharay quarries. The roofs are slated with Welsh slates. The eaves project about eighteen inches beyond the walls and the ends of the rafters are visible under the eaves of all the principal buildings. This arrangement of the eaves was adopted in order to protect the walls from the heavy rains to which the county is so subject, and render them as free from damp as possible. The external walls are not lathed inside, but merely plastered on the stonework. 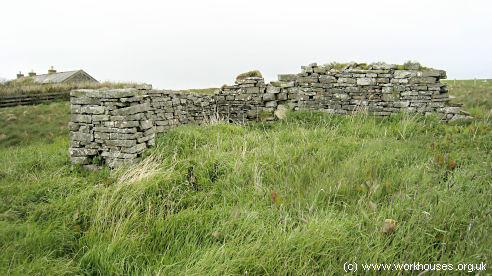 The grounds, extending to two acres, are enclosed by stone walls about 4 ft. high, finished with rough-hewn freestone copes. The airing court walls are 6 ft. high. Two large iron gates with freestone-coped stone pillars give entrance to the grounds from Scapa Road. That portion of the site behind the building has been formed into a vegetable garden, and has been planted this season. The laying out of the grounds in front has not been included in the building estimates, as it is expected that the able-bodied inmates will be bale to execute it under the superintendence of Mr Galloway, the Governor. The works have been satisfactorily carried out by Mr William Firth, the General Contractor, and were finished some time ago, but owing to dampness of some parts of the plaster-work on the interior stone walls, it was not deemed judicious to open the buildings until last week. Mr Firth entered into sub-contracts with Mr J.P.Peace for joiners' and carpenters' works, Mr J.S.Rendall for plumbers' and gas-fitters' works, and Mr Alex Smith for plasterers' works. The various furnishings and fittings were supplied under supplimentary contracts—by Messrs Marwick & Hourston for ironmongery, cutlery, groceries, &c.; Messrs Peace and Low for drapery, clothing &c.; Mr Peter Leonard for furniture, carpets and upholstery; Messrs Wm. Johnston & Co. for the crockery, coals, &c.
Mr John Baikie acted as General Clerk of Works, and Mr T.S.Peace was the architect. The cost of the poorhouse will be about £3,000. The buildings were mostly of one storey, with a two-storey entrance block. Orkney Poorhouse from the north-east, 2001. Males were accommodated in the south-west wing, and females in the north-east wing, each with their own exercise yard at the rear. 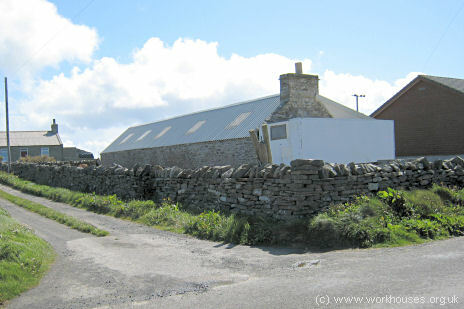 Orkney Poorhouse — male yard from the west, 2001. 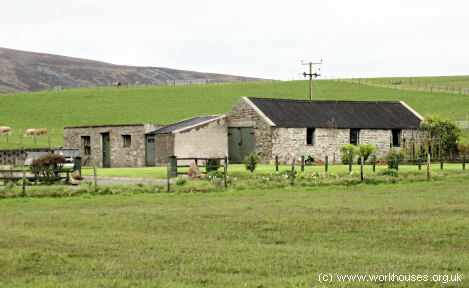 Orkney Poorhouse from the west, 2001. After 1930, the poorhouse became Orkney County Home. In 1946, an official report noted that the establishment had 52 beds in all, for chronic sick, aged and infirm, neglected children and maternity cases. It commented that 'the stone-floored corridors are narrow, dark and cold' with heating provided by a few open fires. The former poorhouse building is still in use. For many years it operated as St Rognvald's House — a council-run residential home for the elderly with 40 beds. It has now been converted to sheltered housing under the name of Andersquoy. 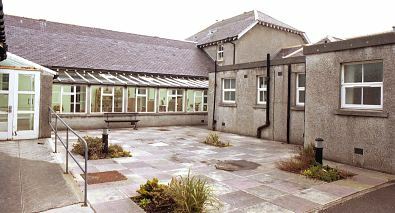 Orkney Library & Archive, 44 Junction Road, Kirkwall, Orkney KW15 1AG. Holdings include: House Committee minutes (1880-1939); Rules and Regulations for management of poorhouse (1883); Specifications of a dwelling house for the governor and for a mortuary (1935). The assistance given by Alison Fraser and David Mackie is gratefully acknowledged.